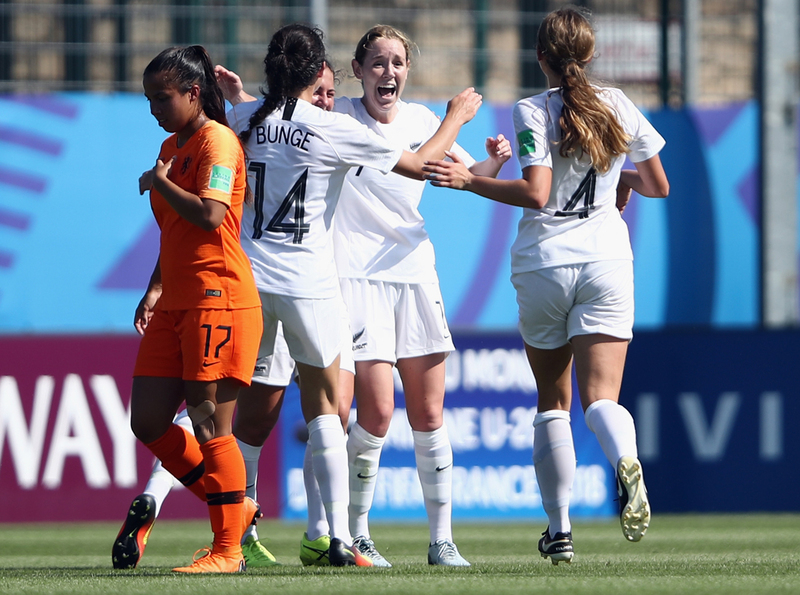 An improved second-half showing and a world-class strike by Hannah Blake weren’t quite enough to deny a classy Netherlands outfit this morning as New Zealand kicked off their FIFA U-20 Women’s World Cup campaign with a 2-1 loss in scorching heat in France. But coach Gareth Turnbull and his players will take heart from the nature of the performance against such an accomplished outfit and, with matches against hosts France and Ghana still to come, will feel their chances of progressing past the pool stages are still alive. “We’re obviously gutted about the result because we had a real belief we could get something from this game,” Turnbull said after watching his side miss out on a point by conceding a late winner. “The strategy was to be conservative in the first half to ensure we got into the half-time break still in the game, address the problems the Netherlands were creating – which I felt we did really well – and then really go at them in the second half,” he added. It looked like the Kiwis were on track to get at least a point on the board as the final ten minutes approached at 1-1 but Eva Van Deursen had other ideas, finding the bottom corner of Anna Leat’s goal after being teed up on the edge of the area by some slick interplay. The fluidity of the passing in that move was indicative of the Netherlands’ play throughout the encounter and they enjoyed nearly 70 per cent of the possession in an entertaining first half. But the well-drilled New Zealand defence proved hard to break down and Turnbull’s side also provided a goal-scoring threat at the other end. They had the first chance of the match on the quarter hour as a loose ball broke to Maggie Jenkins on the edge of the area but her shot was deflected out for a corner. That led to a spell of pressure as a similar effort from Blake seconds later led to another corner. New Zealand could not take advantage though and were indebted to the sharp positional play of Anneka Mittendorff in their own box moments later, the fullback perfectly placed to clear off the line after an uncharacteristic fumble from Leat. The best chance so far then fell to the Netherlands on 22 minutes as Aniek Nouwen, who proved a regular threat from set pieces, got her head to a corner at the far post but put her effort across goal and narrowly wide. New Zealand’s main attacking threat was coming down the right through the pace and skill of Paige Satchell while the Netherlands also had all sorts of problems dealing with the pin-point long throws of Mittendorff. The Dutch struggled to cope with the accuracy of these deliveries into the box and that source brought the first shot on target for either team on 26 minutes when Maggie Jenkins flicked a header into the arms of goalkeeper Lize Kop. Just two minutes later, the Oceania champions found themselves behind though when Fenna Kalma turned the ball home from close range to give the Netherlands a lead they probably deserved on the balance of play. But it wasn’t one they were able to hang onto as New Zealand responded in some style with an early contender for goal of the tournament. Blake had been nursing a back injury going into the match but was able to start and Turnbull will be delighted she did after an outstanding effort drew his side level just before the break. The Netherlands again failed to defend a Mittendorff throw, allowing Samantha Tawharu to flick on for Blake, who turned her defender but was going away from goal and somehow managed to wrap her left foot around the ball and find the top corner from just inside the penalty area. It will go down among the finest goals ever scored by a New Zealander on the world stage and gave the underdogs hope of pulling off a shock result against one of the top sides in Europe. Buoyed by the equaliser and with the hint of an upset in the air, New Zealand gave an even better account of themselves in the second half, despite the energy-sapping temperatures of around 33 degrees at the Stade de la Rabine in Vannes. Their hard work on the training ground nearly paid off just before the hour as a corner was cleverly played along the ground by Jenkins and a double dummy allowed it to reach Grace Jale, whose shot was blocked. The busy Jenkins then latched on to another Mittendorff throw but was at a tight angle after turning inside the box and couldn’t get her attempt on target. Satchell and Tawharu had further sights at goal but both of their strikes were closed down as the match appeared to be heading for a draw until the heart-breaking intervention of Van Deursen in the 78th minute. It was a cruel blow for New Zealand after competing so well but Turnbull was far from downbeat at the final whistle. “To be able to compete toe-to-toe for 90 minutes against one of the best teams in Europe really shows how far the development of female football is coming in New Zealand,” he said. New Zealand will take on France in their second match of the FIFA U-20 Women’s World Cup on Thursday 9 August from 5.30am (NZ time), coverage is live on SKY Sport.